Drummers of a certain age have their lists of undiscovered, video “holy grails,” which usually include Buddy Rich playing two bass drums at the Paramount Theater in 1949, Gene Krupa’s performance with the Benny Goodman band at Carnegie Hall in 1938, and the Buddy Rich/Gene Krupa drum battle at Jazz at the Philharmonic in 1952. While these legendary moments have long been available on audio, no filmed images have surfaced, save for some newsreel footage of the Goodman band shot at Carnegie Hall during the actual concert. These days, however, more and more “never thought to have existed” pieces of video have come to light, so it’s entirely possible that Buddy’s two bass drum bit and the Krupa/Rich duel may be out there somewhere. It is very, very doubtful that any more footage of the 1938 Carnegie Hall concert exists. In the course of researching a recently published piece on the two great drummers for Jazz Times magazine, and an essay on Gene and Buddy prepared in conjunction for a reissue of some of their material, some very curious pieces of information have come to light. This info may perhaps lead the way to discovering another Krupa/Rich pairing, whether on film or audio. 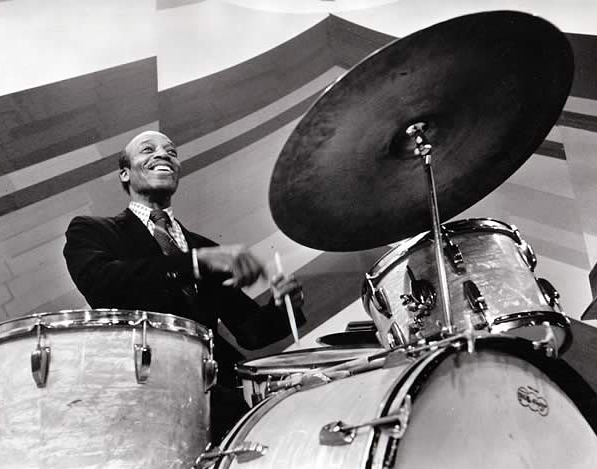 “The Original Drum Battle, as it came to be known, took place at the kick off of what was the 12th National Tour of Norman Granz’ Jazz at the Philharmonic. Most of the JATP dates had early and late shows, and Granz, as was his wont in those days, likely recorded them all. In fact, Billie Holiday actually appeared as a guest star during the early show, singing “Lover Man.” Some 57 years after this happened, a professional recording of it has just come to light. Certainly, there was another drum battle in performed that evening, and at JATP dates in Long Beach, CA and Hawaii, where Krupa and Rich were on the bill. There’s another possibility: The January, 1953, opening of Broadway’s newest jazz club of the time, the Bandbox, was quite the gala, with a bill that included the trios of Krupa, Buddy Rich, and according to some reports, the Oscar Peterson Trio as well. Since the demise of his big band in 1951, Krupa re-formed his famed Jazz Trio with pianist Teddy Napoleon and saxophonist Charlie Ventura. It proved to be quite the attraction, and Krupa traveled regularly with that unit when not on a JATP tour. And yes, Gene played without a bass until English bassist John Drew joined Krupa in 1954 at the insistance of Eddie Shu, making the trio into a quartet. For whatever reason, Buddy Rich was using the same, bass-less format around 1953, with additional trio members being pianist Hank Jones, who sometimes doubled on organ; and star JATP tenor man Flip Phillips. This unit recorded for Granz’ Clef label in December of 1952, and a month earlier, with pianist Lou Levy in for Hank Jones, “The JATP Trio,” as it was called, worked a week at a Denver Club called Rossonian’s. Was Buddy Rich one-third of a tenor/piano/drums trio without a bass because of the popularity of Gene’s bass-less trio? Or was it a matter of economics? Or at the Bandbox, maybe a simple matter of space? Who knows? Rich spent a good time at the Bandbox after this date, playing with his own group and sitting in with other acts on the bill like Harry James. Indeed, as a result of the James/Rich get together at the club in March of 1953, Buddy joined the James big band. He would be in and out of the James group until Rich formed his own unit in 1966. As for Krupa, life after the Bandbox was pretty much the same as it was before, which included regular tours with JATP, recordings in various combinations for Norman Granz, and many gigs in the JATP off-season with a trio that by then included multi-instrumentalist Eddie Shu. Although there is no recorded documentation on hand thus far, there is evidence that Buddy and Gene continued their battles from time to time through 1957. At joint, 1956 radio interview with the Voice of America’s Willis J. Conover, the two drummers spoke of how they felt about the battles, as well as an upcoming JATP show where they were both set to appear. On November 1, 1956, they went into the studio with a group of JATP All-Stars, recording an LP called “Krupa and Rich.” Strangely, Gene and Buddy only play together on one tune, with the rest of the tracks featuring one drummer or the other. Sammy Davis, Jr. played host to the mighty two on a 1966 broadcast of his ABC television program. Sadly, Gene was clearly not well that night. 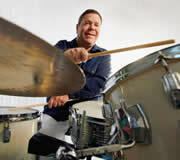 Buddy Rich took that opportunity to wipe the floor with him. The last, on-camera meeting that we know of took place on Oceober 12, 1971. The occasion was a Canadian television special hosted by Lionel Hampton. Buddy Rich came out at the very end of the program to participate in a four-way drum duel featuring Hamp, Krupa, Rich and Mel Torme’. Gene Krupa came off very well in his brief exchanges. WIth the death of Gene Krupa in 1973 and Buddy Rich in 1987, the battles were over forever. This entry was posted on Wednesday, October 28th, 2009 at 9:54 am	and is filed under News. You can follow any responses to this entry through the RSS 2.0 feed. Both comments and pings are currently closed.